With Lim Kian Hwa entered as a 'local' player, Aron Teh was officially Malaysia's sole representative at the super strong Indonesia Open Chess Championship 2013. The above extract from chess results shows our young national champion acquitting himself well and in the process getting 17.5 rating points in the process of beating one and holding one other GM and also three more IMs and one WGM as wll as beating one FM. But it does not tell the tale of the two IM norm chances missed! Aron had his first chance in round nine when he had to win and again in round ten when he again had to win. Perhaps he would have played more solidly if the norm was not on offer (like he did in previous games) and maybe would have ended with more points and rating points? Only he can answer that question but to get himself in that position and hold his own, time and again against so many titled players certainly augers well for him. Well done Aron! As GM Cherniaev told you after the game, just keep playing, the title will come! 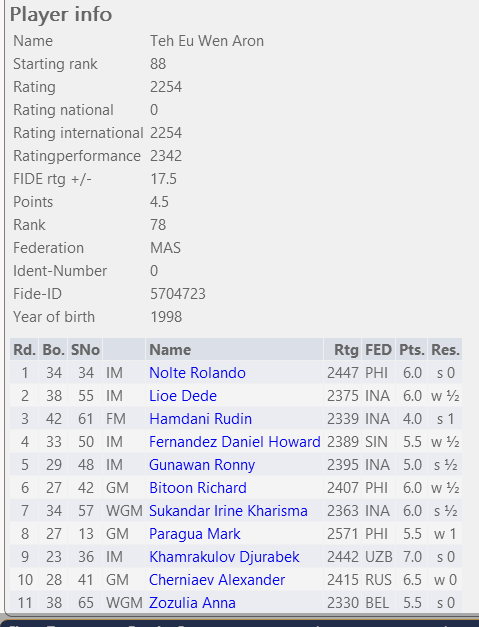 From my calculations, Aron had only to draw his R9 game for an IM norm. Looks like he is now our best bet for that elusive GM Title. Looking Forward to a Great Indonesia Open!